Now offering the newest advance skin rejuvenation – HydraFacial MD. HydraFacial MD is a soothing, moisturizing, non-irritating procedure which addresses many common skin concerns such as improving the appearance of fine lines, extraction of congested pores, as well as reducing hyperpigmentation. Most skin types - young or aging, oily or dry, fair or dark complexions, can enjoy the benefits of HydraFacial MD. This unique procedure combines cleansing, exfoliation, extraction, hydration and antioxidant protection, all in one treatment. Best of all, there is no downtime or discomfort. Schedule your first HydraFacial today and leave our office with clearer, brighter skin. One of the most popular and sought after treatments is IPL (Intense Pulsed Light). This is an excellent procedure for the correction of brown and red pigmentation. Also known as photofacial, it works by delivering high intensity pulses of light to the skin to rejuvenate your complexion. It is virtually painless and requires no recovery time. Some patients are happy after just one treatment, but the bet results are achieved when done in a series. Fractional laser resurfacing is a different form of laser treatment created to erase the signs of aging and sun damage. "Fractional" refers to the fact that only a very small portion of the skin is affected by the procedure. The fractional laser forms miniscule columns of heat that penetrate deep into the skin. The process not only removes the damaged tissue, but also stimulates collagen growth and produces smoother, brighter new skin. With only a tiny percentage of the skin reached by the laser, fractional treatments have a rapid recovery time. Immediately following the procedure, there is little or no discomfort but the skin may be red and swollen. For four to five days afterward, patients should apply ointment to the skin as directed and limit exposure to the sun. 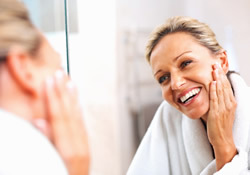 Patients typically see noticeable improvement in their skin a week after the procedure. The final results are generally visible after one to three months. For the best results, we recommend a series of treatments. 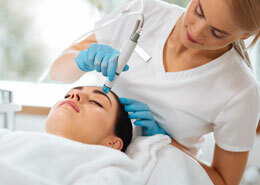 Ideal for patients with light or medium skin tones, fractional treatments can be used anywhere on the face. It is particularly effective around the eyes and mouth, which are two areas that typically develop the first signs of wrinkles and sun damage. It can be used in combination with other laser treatments to maximize your cosmetic results. We currently use the Palomar Lux1540 Fractional™ laser which is the latest generation in skin resurfacing technology.